Kevin Durant enjoys sharing the court with Golden State Warriors team-mate Stephen Curry. 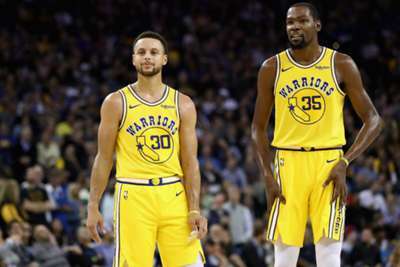 The two Warriors stars have helped lead the team to back-to-back NBA championships and both have been instrumental in the team's 9-1 start to the season. Durant discussed playing with Curry when he met with reporters on Monday. Curry has averaged 32.5 points per game and knocked down 50.9 per cent of his three-pointers to start the season, while Durant has tallied 28.3 points per contest. Durant said the two "read each other" well when they play together. The Warriors will return to the floor and face the Memphis Grizzlies on Monday.